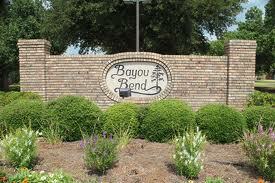 Bayou Bend is arguably one of Bossier City’s most cherished neighborhoods just north of the city on Airline Drive. This is a community where residents take pride in their homes and yards. It’s a safe neighborhood, colorful and clean, with a wide variety of beautiful and unique homes built in the 70’s, 80’s and 90’s. North Bossier is both convenient and yet peaceful, with its large pastures and woodland. With I-220 only minutes from Bayou Bend’s front gate, residents can gain access to the casinos, Downtown Shreveport, Cross Lake, or I-220 to the regional airport. The shopping and dining along Airline Drive and nearby Benton Rd, is both diverse and widespread, and additionally, only a few minutes to the west is the Louisiana Boardwalk with its movie theater and shopping fun. Willis Knighton Bossier hospital is also in close proximity, as well as several top notch private and public schools. The area is home to the natural beauty of the Red River, Cypress Black Bayou, and Lake Bisteneau, offering playgrounds, water sports, fishing, and camping to the residents of Bayou Bend. Tranquil living amongst a safe and beautiful gated subdivision, Bayou Bend just might contain the dream home you are looking for.